The three-day official visit of the President of the African Development Bank, Akinwumi Adesina, to Sudan kicked off with a courtesy call on the Minister of Finance of Economic Planning, Badreldin Mahmoud Abass, on February 26, 2017. The hour-long meeting, which concluded with a press conference, touched on important issues that underscore the bilateral cooperation between the Bank and its country of birth, the Sudan, where it was born some 53 years ago. In their discussion, the Minister of Finance and Economic Planning briefed President Adesina on the country’s economic performance, its challenges and the policy measures taken by the Government to reverse the declining trend in the economy. On the country’s economic performance, the Minister indicated that despite the fiscal challenge engendered by the secession of South Sudan, the country was able to register appreciable growth rates reflecting its resilience. In terms of the challenges facing the country, the Minister intimated that sanctions and sporadic conflicts in some parts of the country have also weighed on economic performance. He, however, expressed the hope that the temporal lifting of sanctions would open up avenues for re-engaging with the international community. On the measures taken by the Government, the Minister alluded to the Economic Salvation Program 2012-2014, the Economic Reform Program (ERP) 2015-2019 as well as the series of macroeconomic reforms including tax reform. He endorsed the Bank’s High 5 development priorities, acknowledging their alignment with Sudan’s latest National Policy Framework, the ERP. The Minister thanked the Bank for all the support it has been providing including the Public Financial Management Project, the Drought Resilience and Sustainable Livelihood Program and, more recently, the Enable Youth Program, to mention only a few. The Minister made special mention of Bank’s efforts at facilitating debt relief for Sudan, focusing on debt reconciliation, development of debt scenarios, preparation of an arrears clearance and debt relief strategy, Interim Poverty Reduction Strategy Paper (I-PRSP), the full Poverty Reduction Strategy Paper (PRSP), support for debt litigation and technical assistance to the African Union High Level Implementation Panel mediating between Sudan and South Sudan on post-secession issues. In addition, he mentioned a series of analytical work undertaken by the Bank which informed policy. For his part, the President congratulated the Minister for weathering the storm despite the challenging environment and encouraged the Government to maintain the momentum of reform, especially in exchange rate policy in the context of the Staff Monitored Program and debt relief. He made special reference of three of the Bank’s ongoing projects as being catalytic in addressing unemployment and poverty. These include the Drought Resilience and Sustainable Livelihood Program, Women Economic Empowerment Project and the ENABLE Youth Program, all of which he believes will build the country’s resilience. He encouraged the Minister to deepen macroeconomic reforms to stabilize the economy. Noting the magnitude of the Sudan’s foreign debt which stood at US $45 billion in December 2015, the President strongly encouraged the Minister to make every effort to scale up political outreach in search of debt relief from international creditors, including the Bank, and reassured him of the Bank’s continued support in the area of technical work. Adesina assured the Minister of the Bank’s continued operational support in technical assistance to improve finance and economic governance and institutional capacity building to enhance social service delivery to improve the quality of life for the Sudanese people, and targeted operations that will address the root causes of conflict and fragility and help the country build resilience. 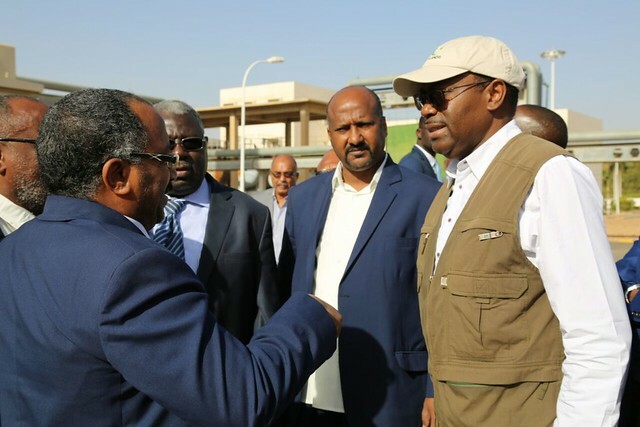 President Adesina was joined in all these meetings by the Executive Director for Sudan, Kwabena Boadu Oku-Afari, the Bank’s Director General for East Africa, Gabriel Negatu, and the Bank’s Resident Representative in Sudan, Abdul Kamara.